The year is 1944. You're four miles high and deep behind enemy lines on a daylight bombing raid. Surrounded by cannon fire and flak, you defend your bomber against a gauntlet of German fighter planes, antiaircraft fire, and experimental jets. This game focuses exclusively on the authentic recreation of WWII-era aerial gunnery, from the realistic rendering of German aircraft to the mood-setting soundtrack to the detailed controls of the American B-17. The Airbus series of short-to-medium range airliners, derived from the classic A320, have made their mark on the airways of the world. 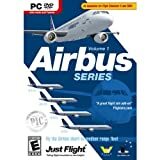 The A318, A319, A320 and A321 are operated by airlines across the globe and now the development team at feelThere/Wilco Publishing has accurately re-created these popular aircraft for Flight Simulator X and 2004 (must be installed prior to running Airbus Series Volume 1). These fly-by-wire favorites, from the compact A318 to the spacious A321, have joined the Pilot In Command series, which guarantees the highest levels of accuracy from flight model and avionics to liveries and interiors. Featuring different engine options, three levels of complexity, and 39 detailed liveries.